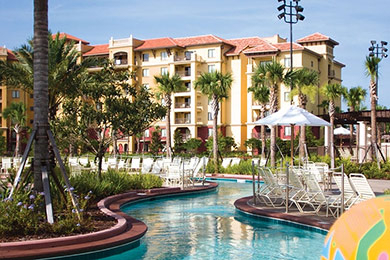 So popular with families that it has its own fan club, Wyndham Bonnet Creek Resort is the closest privately owned timeshare resort to Walt Disney World Resort. 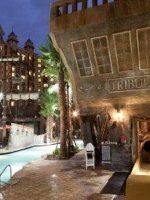 In addition to five fun-filled pools — two with meandering lazy rivers — the resort offers organized family activities, a miniature golf course, an arcade, a game room, a sand volleyball court and a covered playground. Available for nightly rental, spacious accommodations range from 900-square-foot one-bedroom suites to 2,500-square-foot four-bedroom Presidential Suites, all featuring a living room, a dining room, a full kitchen and a private balcony or patio. 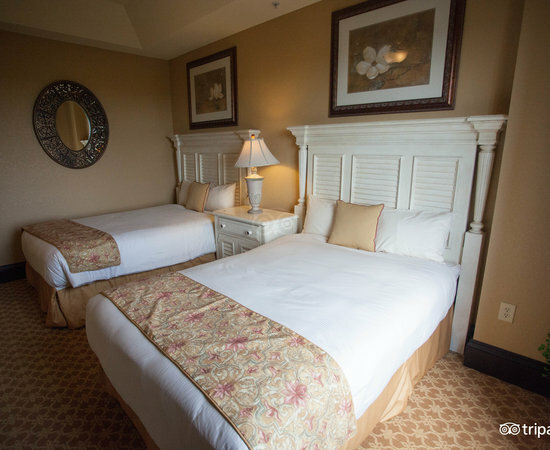 The hotel is traditionally less expensive than Disney World properties, but lacks themed accommodations, transportation services and theme park privileges. 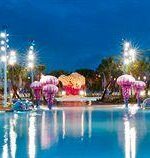 The tropically landscaped six-tower resort is still an attractive option for families seeking budget-friendly rates though, along with extra elbow room, convenient access to the parks and a wide array of recreational amenities. While onsite dining options are limited, guests of the Wyndham Bonnet Creek Resort enjoy privileges at the adjacent Wyndham Grand Orlando Resort Bonnet Creek, an upscale hotel that features three, signature restaurants, a coffee bar, a full-service spa and a themed zero-entry lagoon-style pool. Wyndham Hotels and Resorts are upscale hotels located primarily in the U.S. 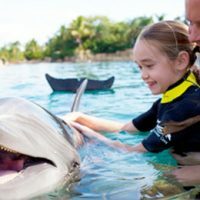 The hotels hold many activities for kids and family-friendly promotions, with onsite dining and an array of rooms and suites to fit families of all sizes. 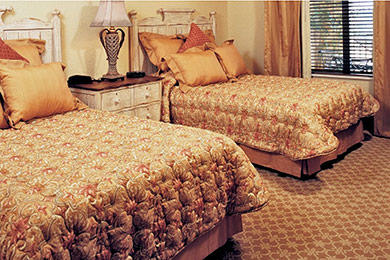 Accommodations at the Wyndham Bonnet Creek Resort are located in six multi-story buildings that surround a 10-acre lake. The first building debuted in 2004 and the last building opened in 2010. Renovations and refurbishments are ongoing. Spacious 900-square-foot one-bedroom suites can comfortably accommodate a young family of four, and feature a master bedroom with a king-size bed, a separate living room with a queen-size sleeper sofa, a dining area and a full kitchen. The suite's single bathroom can be accessed from the adjacent master bedroom, as well as from the living area. Two-bedroom suites, which average around 1,250 square feet, sleep up to eight and feature a master bedroom with a king-size bed, a guest bedroom with two double beds, a full kitchen, a living room with a queen-size sleeper sofa and two bathrooms. These suites are ideal for families with teens who desire a private sleeping area with a door and a second bathroom. Three-bedroom, two-bathroom suites are 1,500 square feet and can sleep up to 10 people. Four-bedroom, four-bathroom suites (approximately 2,000 to 2,500 square feet in size) offer a layout particularly friendly for multi-generational families or two families traveling together. These accommodations can sleep up to 12 people and feature two master bedrooms with king-size beds, two master bathrooms and two additional bathrooms and bedrooms. Pack 'n' Plays and highchairs are available on a first-come, first-served basis. Bedrails are not available. 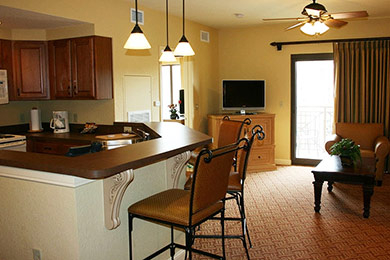 All suites offer a washer and dryer, a DVD player and a private balcony or patio. There is a Jacuzzi-style tub in all master bathrooms. Free Wi-Fi is available in all accommodations. Kitchens are fully stocked with pots, pans, bakeware, plates, bowls and utensils. Each kitchen is also equipped with an oven, stovetop, dishwasher, full-size refrigerator with a freezer, microwave, coffee pot with a starter supply of coffee and a toaster. Daily cleaning service is not included for guests staying two to seven nights, but may be arranged for a fee. Suites are stocked with basic cleaning supplies and equipment, including dish soap, dishwasher detergent, a vacuum cleaner and a starter supply of laundry detergent. Bathrooms are stocked with toiletries. But toiletries are not replenished daily, so you might want to pack your own if you are planning an extended stay. Likewise, towels are replaced only on an as-requested basis. Call housekeeping to request a "towel swap." A pool towel is issued to each guest. Get yours by presenting a room card. Note there is a significant fee for towels that are not returned by check-out time. Make a note to keep tabs on yours, or else bring your own. There are few "hooks" for pool towels in the accommodations. Designate a spot to dry towels (like the balcony) and make a habit of hanging them there, or bring your own hangers. With regard to location, pool-facing rooms on the ground floor can be convenient, albeit noisy. For a nice outlook, request a lake view. It's possible to see both Illuminations (Epcot) and Wishes (Magic Kingdom Fireworks) from your room. For best results, call ahead to request a Disney-facing room on a high floor with a fireworks view. After an exhaustive business week, I took advantage of the Easter holiday weekend and stayed 2 night at this vacation club resort. Beautiful grounds and have lots of amenities and activities for all ages. There were a few “customer service “ deficiencies that I would like to share with the leadership team here, other than being assigned a handicapped room it was a nice resort. 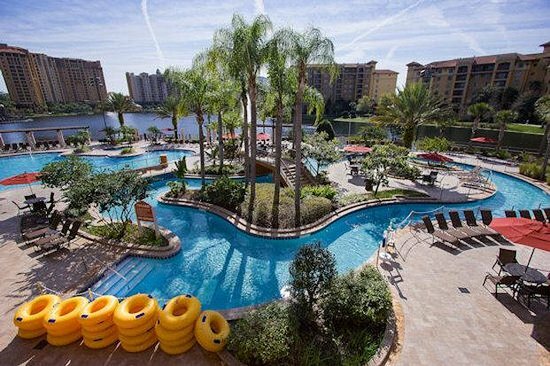 We have stayed at Bonnet Creek the last 3 times we have come to Orlando and we have had a wonderful vacation each time. Beautiful place with plenty of pools and activities. rooms are great with plenty of space. Friendly staff. We were a little bummed that they charge for the shuttle now, so we did not use that service. But it is close to everything Disney. 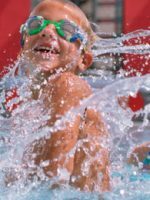 Wyndham Bonnet Creek Resort offers five pools -- two with meandering lazy rivers -- as well as two children's wading pools, a splash playground and multiple hot tubs. Among the most popular recreation spots for families, the resort's lazy rivers are located at the Puerto de Leon Pool (a fort-themed pool with zero entry) and next to the pool near Escudos. Inner tube-style pool floats are complimentary. You may bring your own life jackets. Waterslides are located at the La Cocina pool (guests must be able to swim without assistance) and the Torre de Sol pool (guests must be 48-inches or taller to ride the waterslide). A lifeguard is posted at the latter. Check the Activities Board for waterslide hours. Pools are heated and range in depth from zero-entry to around five feet. Pool hours are 8 a.m. to midnight. Hair wraps and temporary tattoos are available at select pools in the afternoon for a fee. Relax in style when you rent a cabana, available at the Torre del Sol and Escudos pools. In addition to lounge chairs and a ceiling fan, each cabana has a mini-fridge and TV. At the resort activities center, located in Tower 6, you can rent DVD's, check out board games and controllers for video games, sign out miniature golf clubs and sports balls, or play pool (billiards) or Wii games with friends and family members. Check the resort activities schedule for planned entertainment like face painting and balloon artists. Center hours are 8:30 a.m. to 10 p.m. Play air hockey and an assortment of video games at this fun spot, located on the ground floor of Building 6. A token machine is available. Located next to Tower 2, an 18-hole miniature golf course is open, weather permitting, from 9 a.m. to 9 p.m. Golf clubs and balls are complimentary and may be checked out at the Activities Center. Situated in the Village Center on the first floor of Puerto de Leon, this staffed room for arts and crafts activities is open from 9 a.m. to 4 p.m. Craft project options for all ages are available, and include glass-beaded jewelry, stuff-your-own bears, ceramics and design-your-own autograph books; fees vary. Check the current Activities Guide for times and details. A sand volleyball court is located between the miniature golf course and the playground, between Tower 1 and Tower 2. Check out balls at the Activities Center desk. Appropriate for small children, a small covered playground with swings and a climbing structure is situated next to Tower 1, near the volleyball court. Limited bench seating is available. Planned activities are ongoing throughout the resort, and include pool-centered activities (boat races and pool games), adult-oriented activities (Casino Night), family activities (make-your-own ice cream sundaes, bounce house parties and evening outdoor movies) and arts and crafts, much of which take place in the Craft Room and are available for a fee. 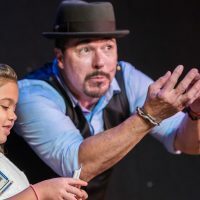 Some activities, such as a "Digital Scavenger Hunt," "Gatorland Experience" and "Teen Billiards" are especially friendly for tweens and teens. 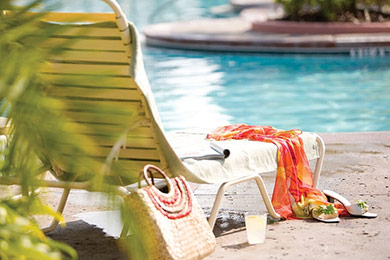 Besides a range of planned holiday events, the resort offers scheduled live musical poolside entertainment. Located just outside the main lobby, La Cantina Grille offers kids meals, as well as quick-service favorites for breakfast, lunch and dinner. Kids lunch and dinner options include favorites like chicken tenders, grilled cheese, a hot dog or a peanut butter and jelly sandwich. Kids meals are served with carrots, applesauce and a fountain drink. Breakfast choices include hot breakfast sandwiches, fresh fruit, cereal, muffins and bagels. Burgers, wraps, grilled and vegetarian sandwiches are served with potato chips at lunch and dinner. French fries and onion rings can be ordered a la carte. Juice, bottled soft drinks, water and Starbucks coffee are also available. There is no in-house seating, however, a few dining tables are available in the covered resort breezeway. La Cantina Grille is open from 7:30 a.m. to 9:00 p.m.
Order pizza by the slice or by the pie at this casual poolside eatery, which also offers room-delivery service. Pizza varieties include cheese, pepperoni and vegetable. Sandwich wraps and Italian-style salads (antipasto, pasta, Caesar with or without chicken) are also available. Dessert choices include chocolate cake and Reese's Peanut Butter Cake. Soft drinks, fruit smoothies and non-alcoholic frozen drinks are also available. Ample covered patio seating is provided. La Cocina Pizzeria is open 11:30 a.m. to midnight. Located next to the Escudos pool, this venue offers sandwiches, salads and gourmet hot dogs, as well as non-alcoholic drinks and smoothies. Complimentary ice water is also available. At this resort convenience shop, located off the main lobby, you can buy snacks, limited groceries, coffee and personal and first aid items, including sunscreen. El Mercado is open from 7 a.m. to 10 p.m. weekdays. The shop is open until 11 p.m. on weekends. At the Wyndham Grand Orlando Resort Bonnet Creek next door, you'll find five additional dining options, including Deep Blue (an upscale seafood and steak restaurant), Bar 1521 (the adjacent bar serving snacks and cocktails), Tesoro Cove (a casual venue with a children's menu), Backbay Pool Bar (a poolside grill serving snacks, salads and sandwiches) and The Barista (a coffee bar and gelato counter). If you know that you will need a Pack 'n' Play, it's best to have a contingency plan in the event that the resort does not have one available. Services in the area that deliver include A Baby's Best Friend and Orlando Baby Rental. Orlando Baby Rental offers full-size crib rental, as well as strollers and other equipment. 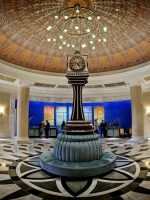 Since this resort is a timeshare property, it's common to see tour-goers and timeshare marketing representatives -- the latter of which might approach you to offer a "free tour." If you're not interested in taking a tour, politely but firmly decline, and skip the "parking pass" desk at check-in, as the distribution of parking passes (not needed by resort guests for parking access) is a popular marketing ploy. Do you want to surprise the kids with a special welcome when you check in or return after a busy day at the theme parks? Order them a customized "Balloon Bouquet." One-day advance notice is requested for orders. 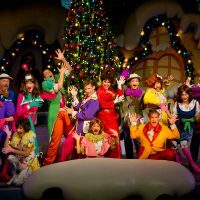 You can buy Walt Disney World Resort theme park tickets at an onsite Disney Planning Center, located in Torre del Sol. Babysitting is available here from 8 a.m. to 4 p.m. for a per child, per hour fee. Situated near the Craft Activities Center, a small fitness center can be accessed with a resort key card and offers bikes, treadmills, steppers and some weight equipment. Pizza delivery is available from La Cocina Pizzeria and businesses pre-authorized (access is limited for safety reasons) by the property. Check with the front desk for details. Industrial-quality gas grills are conveniently located in three areas throughout the resort. Use is complimentary for resort guests, and picnic seating is nearby. A number of services are available for those desiring grocery delivery. Options include Wegoshop.com and Netgrocer.com. Nearby grocery-shopping options include Publix supermarket, Wal-Mart Super Center and Whole Foods Marketplace. School breaks are the busy season in Orlando. If you're traveling during Presidents Day, Spring Break season, Christmas or summer, expect to find lots of company at the resort and at the theme parks. If you're looking for more elbow room and want to swim, mid- to late-September can be a great time to visit. If you're seeking a good deal and don't mind cooler weather, the period immediately following Presidents Day and prior to Spring Break and Easter is a less busy time when discount rates are often available. If you're visiting during the summer, pack your patience along with tools for braving the heat. Popsicles, plenty of ice water, sunscreen, hats and planned pool time are all good survival strategies. From Orlando International Airport (MCO): To reach the resort by car, take South Exit Road from Orlando International Airport to SR 417 Toll Road (GreeneWay) West and follow signs to Walt Disney World/Disney's Caribbean Beach Resort. Before Disney's Caribbean Beach Resort, turn left on Bonnet Creek Parkway. Follow signs to the resort. Resort parking is free for guests. While the property is adjacent to Walt Disney World, you can't travel to the theme parks safely by foot. Shuttle service to downtown Disney and Walt Disney World's theme parks is available for around $5 per person, round-trip. Children under 4 ride free. Strollers are permitted on the shuttles, but they must be folded. Shuttles run approximately every half hour until park closing time. Request a schedule at check-in. 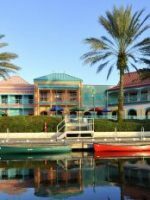 By car, from Wyndham Bonnet Creek Resort, figure on travel times of 5 to 15 minutes to Walt Disney World's parking lots. 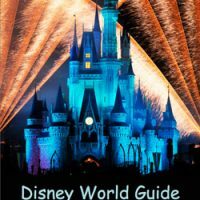 Disney's Hollywood Studios and Epcot are a five-minute drive, Animal Kingdom is 10-12 minutes away and Magic Kingdom is around 15 minutes from the resort. The resort grounds are expansive, and little legs will likely tire quickly traveling to the many activities located throughout the property, especially if you plan on "pool-hopping." It's a good idea to bring a lightweight collapsible stroller or rent or buy one in Orlando. Book a babysitter in the evening (check with the concierge for local recommendations), and enjoy an adults-only dinner at Deep Blu Seafood Grill at the Wyndham Grand Orlando Bonnet Creek Resort next door. Reservations are recommended. If you're a golfer, you can book a tee time at the Waldorf Astoria Orlando Golf Club nearby. Alternatively, you might consider scheduling an outdoor cabana massage at Blue Harmony Spa at the Wyndham Grand Orlando Resort Bonnet Creek.